Kids will love learning letter and number formations with these dot-to-dot stampers. These 1 1/2"Sq. 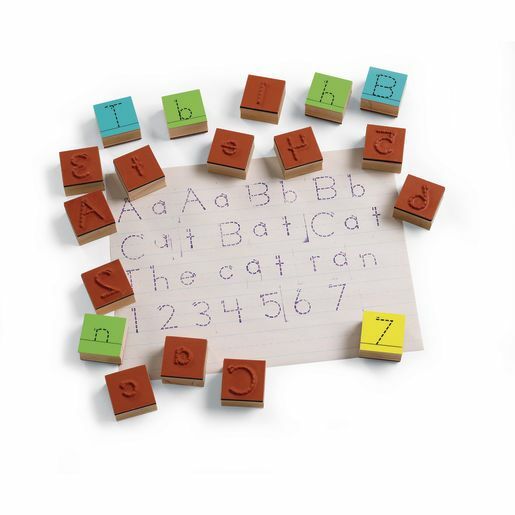 solid wood and rubber stamps are easy for little hands to hold. Printed "baseline" on top of stamp facilitates proper placement on our 1" ruled paper. 62 stampers: 26 uppercase and 26 uppercase letters, 10 numbers (0-9). L.K.1a Print many upper- and lowercase letters. L.K.1f Produce and expand complete sentences in shared language activities. L.K.2d Spell simple words phonetically, drawing on knowledge of sound-letter relationships.